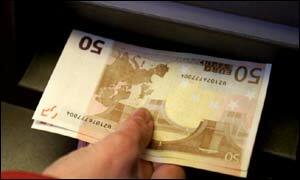 Spanish police say they have uncovered a new type of fraud involving bank cashpoint machines. Police are investigating the cashpoint fraud in towns along Alicante's Mediterranean coastline. So far, two men have been arrested in the seaside resort of Torrevieja. The men are alleged to have used miniature cameras to copy cashcard pin numbers and withdraw thousands of euros from victims' accounts. The men are said to have secured camouflaged miniature cameras to cashpoint machines, and then attached new swipe card readers. Police say the men would wait in a nearby vehicle, while the concealed miniature camera relayed images of people typing in their confidential pin numbers. Meanwhile, the replaced swipe card reader transferred information to special computer software that replicated the cashcard's magnetic strip. Using this information, police say the men have stolen an estimated 36,000 euros from cashpoints at different locations in Alicante. The arrests form part of an investigation by Spanish police called Operation Remote.